When we had a stick and brick house we loved to garden. We gardened as close to organic that we could in today’s world in a large city. We composted, mulched, and raised chickens and bees. Our garden was lovely and charming, but a lot of work at times. However, after a few years we were introduced to a film entitled Back to Eden Gardening. The film shares the journey of Paul Gautschi to get back to the “simple, productive growing methods of sustainable provision that were given to man in the Garden of Eden”. The film showed wonderful fruits and vegetables that he grew and he talked of the tours that he gave on a regular basis. His ways became our ways and our garden got even better and with less work! He lives not far from where we are parked in the Olympic Peninsula. I just had to go see his garden and meet this shy sweet Godly man. We arrived a little early for the tour time, but there was already a crowd gathering. Paul shows up before tour time to meet and greet each of us. He is a soft spoken, gentle person with a love of the children in the crowd. They gather around him as he led us through his treasured green garden of huge vegetables and ripe orchards with no pests. He pulls fruits and vegetables from the garden and passes out samples of herbs, cucumbers, apples and the like as we walk through the rows. 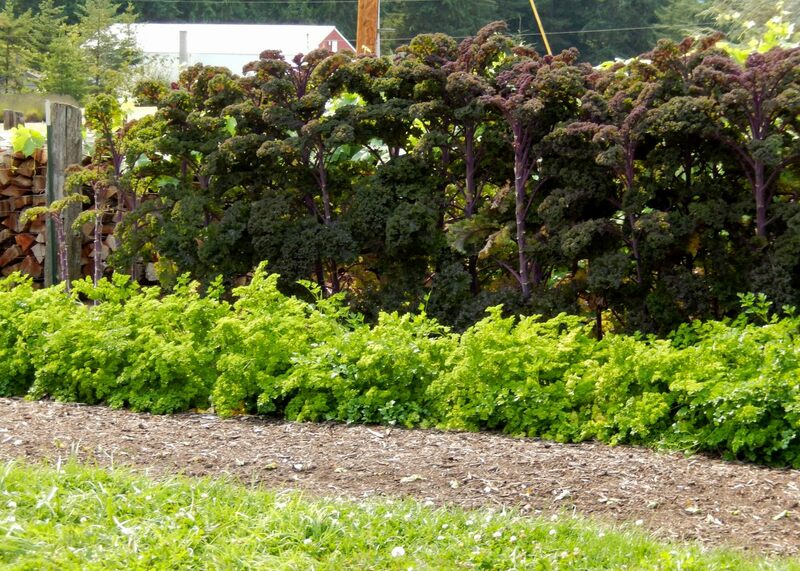 Even the Kale is tasted with amazement by each of us. The soil is rich, dark and soft, the food is sweet, moist and tasty, fresh off the vine. He shares generously and talks of his struggles to get his garden right with little water and a short growing season. He credits his techniques as God’s natural way of gardening the earth. He points to the forest floors and discusses the rich soil beneath the trees. His tour is fabulous and he welcomes all. There were oohs and awes as we sampled his produce. The children giggled with delight at the yummy vegetables he passed around. Some in our group were beginning gardeners, others were professional organic growers, and there were even a few vegans wanting to see how a working plant based diet is grown. We all walked away richer and amazed at the small farm, the dear man that tends it and with an appreciation of how well grown vegetables and fruit should taste. Paul in now known worldwide for organic gardening. Some say that he is the ultimate standard. His wife, Carol Gautschi is also known worldwide as a midwife. She teaches across the globe the gentle birth midwifery ways. Together they have seven children. What a lovely afternoon. We left smiling and felt blessed.